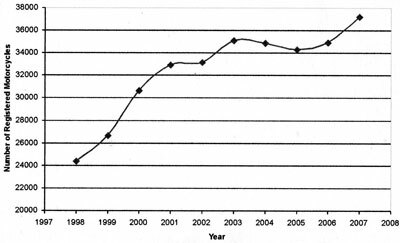 The number of motorcycles under current licence in Ireland has increased from 24,000+ in 1998 to 37,147 in 2007. A 39% increase over a ten year time. Motorcycles represent less than 2% of the total vehicle fleet yet motorcyclists account for 12% of road fatalities and 10% of road injuries each year. 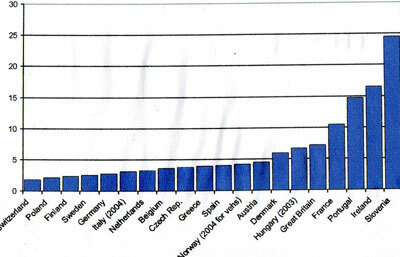 In terms of fatality rates per 10,000 registered motorcycles, Ireland was found to have the second highest rate amongst the twenty countries compared. Motorcyclists are vulnerable road users. In 2007, 33 motorcyclists were killed and a further 410 were injured on Ireland?s roads, accounting for 10% of all fatalities, and almost 5% of all casualties resulting from road collisions in the country. This is of particular concern since motorcycles accounted for less than 2% of all licensed vehicles in the Republic in that same year. 32% of all motorcyclist fatalities occurred during the hours of darkness. Peaks occur in the morning and evening peak hours during weekdays. 71% of motorcyclists were killed or injured in built-up areas in the ten years to 2006. 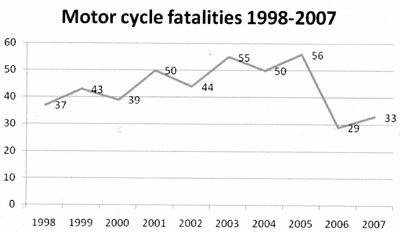 The number of motorcyclists killed on two-way carriageways showed an upward trend until 2006. 66% of motorcycle collisions occurred away from junctions in 2006. In the majority of the motorcycle casualties analysed, the contributory actions were not recorded. In collisions where the contributory factors of motorcyclists were recorded, these were: - „exceeded safe speed limit?, - „went to wrong side of the road? - „improper overtaking. 14% of motorcyclist casualties resulted from collisions involving other vehicles driven unaccompanied learner drivers. Who are the motorcyclists most likely to be injured. Males in the age group 17-39 have the highest casualty. Males in the age group 20-24 have the highest fatality. The number of motorcyclist casualties aged between 25 and 59 has shown a steady increase in Ireland between 2002 and 2006, and so the development of training for returning motorcyclists may be particularly relevant here. Motorcycles are less stable, less visible, and have different braking systems to those of other vehicles, and so may be potentially more dangerous for young, inexperienced road users to ride safely. In addition, they are likely to be cheaper to purchase and run than cars, making them more attractive to younger road users. There is therefore a need for specialist rider training and testing for motorcyclists. The Road Safety Authority set itself a target to be met within the period of the Road Safety Strategy 2007-2012 which involves ensuring that 100% of all new learner permit holders in the motorcycle category undertake the compulsory basic training, and to maintain this thereafter. The compulsory training scheme developed by the Road Safety Authority for novice motorcyclists in Ireland will involve Approved Driving Instructors giving specialist training in line with an agreed syllabus to novice riders.